Home Guest Posts SEND reforms: Transformation or Missed Opportunity? 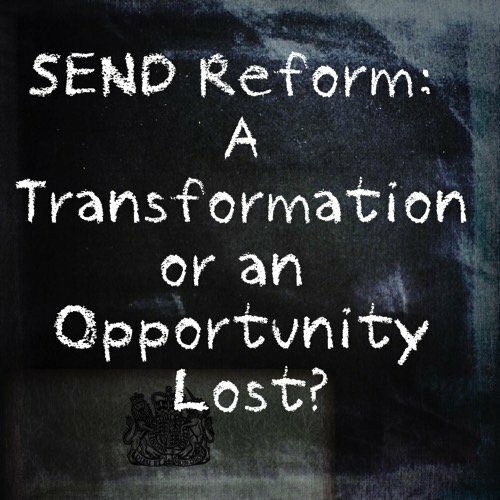 SEND reforms: Transformation or Missed Opportunity? A research paper discussing the 2014 special educational needs reforms in England, has raised serious questions about the legislation's ability to improve inclusion and equality for those it was designed to help. In his paper, Nick Peacey, Visiting Research Associate, at UCL Institute of Education, questions how the reforms reflect the UK's commitment to international rights conventions and suggests that ideology took precedence over whether the new legislation could work with the existing educational environment in England. Nick Peacey's paper, published by Research and Information on State Education (RISE) calls for a review of the reforms, and he has very kindly expanded upon his findings exclusively in today's guest post, below, for Special Needs Jungle. Let’s start with a quiz. Answers are in the paragraphs below and discussed in more detail in my RISE paper. The sections in brackets relate to where you can find this in the paper itself, the link for which is at the end of this post. 1. (Section 8.4) By what percentage did GCSE scores for English pupils with special educational needs on free school meals (FSM) drop between 2013 & 2014? 2a. (Section 10.4) How much does the state spend annually on teaching assistants (TAs)? 2b. If a parent or carer wants to know if their child’s school is deploying their TAs effectively, where can they look for the most up-to-date advice on best practice? 4. (Section 9.9) A recent report for the Government points out that ‘some schools in the system are struggling to meet the expectation that they should fund the first £6000’ to resource an intervention for an individual with SEND. Which two types of school were mentioned as having particular difficulty? 5. (Section 9.8) What reason did the House of Commons Education Committee give for emphasising the need for minimum standards for the Local Offer in its 2012 report? i. So Ministers would know what to expect of every local authority? ii. So Ministers would know what to expect of every school? iii. So parents would know what to expect of every local authority? ii. So parents would know what to expect of every school? 6. (Section 8.3) What percentage of PSHEE lessons did Ofsted’s 2013 Review find inadequate or requiring improvement? My paper offers answers to the questions above and I hope many more. I wrote it in some frustration. Despite the mighty SEND labours of the last few years we find ourselves with the same stubborn statistics (about seven out of ten exclusions are still for SEND pupils, 1.4% of 0-18 year olds are in specialist provision(Q3)) with some new stinkers to contemplate: very possibly because of new assessment arrangements, there has been an extraordinary drop between 2013 and 2014 of 32% in GCSE scores for those identified as having SEN from the poorest families- those eligible for free school meals. So what is going on? My answer is based on the mass of international evidence that tells us that you can’t do much through special provision until you take good care of the ordinary day to day sort. In other words, the 2014 Children and Families Act and the 2014 SEND Code of Practice may be worthy enough, but can’t compete with sweeping curriculum and assessment changes, neglect of Personal, Social Health and Economic Education when Ofsted finds 40% of lessons requiring improvement (Q.6) and the weakening of local support by a thousand cuts. Policymakers do not help when they ignore or misunderstand research on the ordinary, such as that on the dangers of grouping by ‘ability’ for lower attaining pupils (Section 8.6). Two documents offer pointers to getting ordinary practice right. The superb Ofsted SEN Review in 2010 worried at the number identified as having SEN (the press grasped that) and also pointed out that even if SEN were identified, you were far from certain to get appropriate provision (the press did not grasp that). The House of Commons Education Committee emphasised the Local Offer as an opportunity for parents to understand what all schools [its phrase] should be providing as a minimum standard for ‘low to moderate SEN’ (now named SEN support), so that they would feel less need to ask for assessment for an EHCP. This must be right, mustn’t it? Children and young people should only be identified as having ‘special’ needs if we can reassure ourselves that they have had the best that ordinary teaching can give them. Otherwise special provision becomes a way for schools to evade their responsibility to first rate teaching of all (not just the ones on the C/D grade boundary!) and an escape route for desperate parents to build something beyond what is on offer to their child. Then ‘SEN support’ must really mean something if the pressure for the guarantees seemingly offered by the EHCP is not to drive the system. Inhabitants of the Special Needs Jungle know that is not the whole story: as Edward Timpson has wisely said, ‘We have to change the culture’. A laissez-faire approach to ordinary provision by schools, colleges and other settings is unlikely to change the culture in a context that stresses individual institutions’ academic success above all. You can see this in the report for the DfE that is the source of Question 4: the schools that were found ‘struggling to meet the expectation that they should fund the first £6000’ of an individual SEN intervention were unsurprisingly, small schools, and most significantly, ‘the most inclusive schools’ those that most willingly welcome students with SEND. The new Code of Practice, with 282 pages weighed down by the minutiae of EHCP procedures, cannot do an adequate job as guidance on ‘ordinary’ provision. For example, consider that poor management of ‘additional adults’ such as teaching assistants, can mean a pupil with a TA making slower progress than one without. Making best use of teaching assistants (Q2b), should be read by everyone in the Jungle. It tells us that we spend £4.4 billion a year on TAs (Q2a): the Code only offers a few lines on how we should be making the best of this expensive investment. ensure that interventions, are appropriate, timely and properly reviewed and modified as necessary. a model of peer review when a group of local authorities (perhaps 4 or 5) brings relevant data on provision, outcomes, admissions and exclusions of pupils to a ‘share and compare’ event, where LA teams, including parents and disabled students can ask questions and share ideas on how they are enhancing equity in education, particularly in relation to SEND. The paper is available here: http://www.risetrust.org.uk/node/62.